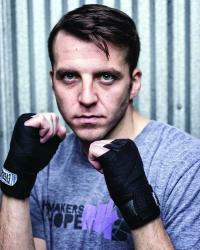 John Fitzgerald hasn’t stepped into a boxing ring since he was a 12 year-old training at the McKeon Post. But he’ll give it a go again on May 19 when he tries to knock out cancer— and his opponent—at the Haymakers for Hope sixth annual Rock n’ Rumble charity event at House of Blues Boston. Fitzgerald, 34, is the son of Kevin Fitzgerald, the legendary Boston state representative from Mission Hill. His dad passed away from cancer in 2007. Fitzgerald currently works for Imagine Boston 2030 out of the Mayor’s office. working on the city plan. Fitzgerald is currently training at Peter Welch’s gym in Dorchester alongside four other participants who will be competing on May 19. Haymakers for Hope is a non-profit organization that literally fights for a cure to cancer, takes novice boxers and arranges four months of professional boxing from a gym in the participant’s neighborhood. Thirty men and women will compete throughout the night against an opponent of equal skill. Since training, Fitzgerald has fallen in love with boxing, and it even inspired him to run for the Boston Marathon last month. To learn more about Haymakers for Hope, buy tickets to the event, and donate to Fitzgerald and the other participants, please visit haymakersforhope.org.